What to do about food chemicals eaten in tiny amounts? My once-a-month, first Sunday Food Matters column in the San Francisco Chronicle is about the difficulty of figuring out the health effects of food chemicals consumed in low doses. Editor’s note: Nutrition and public policy expert Marion Nestle answers readers’ questions in this monthly column written exclusively for The Chronicle. E-mail your questions to food@sfchronicle.com, with “Marion Nestle” in the subject line. Q: I don’t understand why the FDA does not ban aspartame, food colors, BPA, pesticides and all those other nasty chemicals in food. I can’t believe they are good for us. A: I can’t, either. But the Food and Drug Administration is required to make decisions on the basis of science, not beliefs. You eat these chemicals in tiny amounts – parts per billion or trillion. Whether doses this low cause harm is hard to assess for two reasons: science and politics. Scientists cannot easily measure the health effects of exposure to low-dose chemicals. And the industries that make and use these chemicals don’t want to give them up. Food chemicals elicit plenty of public dread and outrage. But are they harmful? Controlled clinical trials at normal levels of intake would require vast numbers of subjects over decades. Nobody would fund them. Instead, researchers use animals consuming much higher doses. I can remember how the diet soda industry ridiculed studies suggesting that saccharine caused bladder cancer in rats: the doses were equivalent to drinking 1,250 12-ounce diet sodas a day. The difficulties of doing research on low-dose chemicals – and the food industry’s insistence that such doses are safe – explains the FDA’s reluctance to act. Some examples illustrate the problem. Some studies suggest that aspartame might cause cancer in rats when consumed at levels typical of diet soft drinks, as well as other problems. But researchers performing better controlled studies have given aspartame a clean bill of health. These have been considered a possible cause of hyperactivity in children since the 1970s. Some studies show improved behavior among children placed on additive-free diets. But behavior is difficult to judge objectively, and even controlled studies gave mixed results. A recent study funded by the British Food Standards Agency is typical. It found most children to be unaffected by removing additives. But a small percentage seemed to get better. The FDA can only conclude that there is not enough science to decide whether food dyes cause hyperactivity. BPA is a component of hard plastic used to make baby bottles and food and beverage cans. It is also an endocrine disrupter. Last year, the FDA concluded that BPA is safe at current exposure levels. At the same time, the FDA advised children and pregnant women to reduce exposure to BPA. It advised the infant formula and soda industries to find ways to replace it. The California Legislature has passed AB1319 banning BPA from baby bottles and sippy cups; it’s awaiting Gov. Jerry Brown’s signature. Recent studies raise concerns about BPA’s effects on the brain and behavior of fetuses, infants and young children, and on cancer, obesity and infertility in adults. Some studies suggest that exposure to BPA is higher than previously estimated. Just last week, the Breast Cancer Fund released a study finding BPA in canned foods designed for children. Studies by university scientists tend to find harm from BPA at low doses, whereas those by government regulatory agencies and the food industry do not. In the absence of compelling science, regulators have two choices: exercise the “precautionary principle” and ban the chemical until it can be proven safe, or approve it until it can be shown to be harmful. The United States and European safety agencies – and the food industry, of course – prefer the latter approach. Research clearly demonstrates that pesticides harm farmworkers exposed to high doses. But recent studies report slightly lower IQ levels in children born to urban women with higher blood levels of pesticides. Although these studies did not control for socioeconomic and other variables that might influence IQ, they raise the possibility that even low levels might be harmful. While waiting for the science to evolve, you can take both personal and political action. You don’t want potentially harmful chemicals in your foods? Read labels and don’t buy foods with artificial sweeteners or food colors. Kids don’t need them anyway. Consumer action has already induced baby bottle makers to get rid of BPA. This strategy can work for food colors, too. Don’t stop eating fruits and vegetables. Their known health benefits greatly outweigh the potential harm of pesticides. Don’t stop eating them. Buy organic. Pesticides, invisible and unlabeled as they are, constitute a good reason to do so. Get political. Let your congressional representatives know that more research is needed, but you don’t want to wait for it. You want industry to find healthier alternatives. 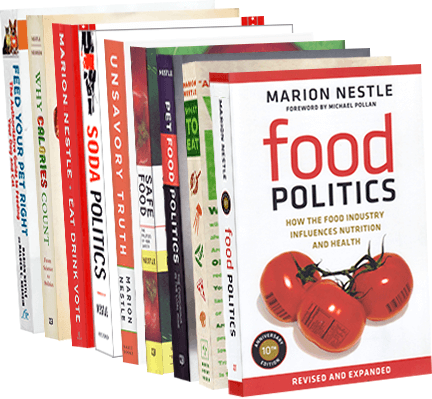 Marion Nestle is the author of “Food Politics” and “What to Eat,” among other books, and is a professor in the nutrition, food studies and public health department at New York University. E-mail comments to food@sfchronicle.com. Wild salmon are a gorgeous salmon pink because the fish eat marine krill, tiny crustaceans loaded with pigments – mainly one called astaxanthin but also another called canthaxanthin. These get incorporated into the salmon’s flesh and can be identified by testing laboratories…. Farmed salmon, alas, are not fed krill. Instead they are fed pellets like the ones fed to cats or dogs. As a result, their flesh is an unattractive gray color. Research on the industry-important question of what best sells salmon demonstrates two things: the darker its pink color, the more likely you are to choose it over more lightly colored salmon; and if the salmon is gray, you will not buy it at all. So salmon farmers resort to cosmetics.